Hbd chick recently posted this, which she put together from two sources, about consanguineous marriages in Japan. Well given how their birth rate has fallen, I suspected that their consanguinity must have fallen but was unable to run down numbers on my own. Thank you hbd chick. She had some questions. I thought they were so good I asked whether I could post them and my answers here. She kindly gave permission. For the purposes of the hbd chick blog her handle is Big Nose Kate. I use my own name. I confess that the imagination shown by the names is greater than what I can muster. Your concluding graph looks like a coiled serpent! ………But have I understood? Is the final graph based on 3 scales, with Time being the reason why the line curves back and forth? Are all populations somewhere on that line? Yes, it looks like a snake. The circles in the graph each represent a single year. The size of each circle represents the size of the population of Sweden that year. The head of the snake is the last year for which they have data. In that year age at first marriage was higher than it had ever been before and it had been rising for several years. The tip of the tail of the snake is a year I chose in order to clean up the graph. Birth rate and age at first marriage vary from year to year. What I wanted to show is that from the first year (tip of tail) birth rate falls below replacement (about 2 per woman) and then stops falling, goes up and down (back and forth on the graph) but neither recovers nor continues to zero. This is a pattern almost all countries are following although at different stages. It is only meta stable. 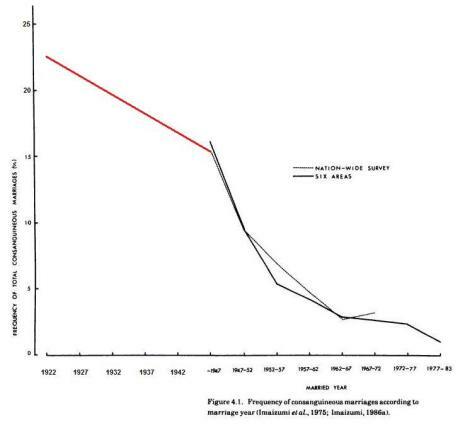 You can’t push the age at first marriage up forever without eventually having the birth rate collapse. I think it would be better to look at it on gapminder.com, but I find their print very hard to read these days. It used to be easier. Are you saying that there are natural laws (if so, are they Newtonian or Quantum?) that govern the lifespan of a ‘community’, and that those laws enable speciation to operate as a process? Yes, I say absolutely. First let me give my own slant on “law of nature.” It should be a proposition that is true in all times and places where there is an appropriate context. The most commonly spoken of laws of nature are Newton’s laws of motions, which include gravity. Actually that last one is not a law. It’s not even true. Einstein’s theories of relativity give different answers, and testing them shows that Einstein is right and Newton is wrong. Yet we persist in refering to Newton’s laws. Of course the difference for practical purposes is infinitessimal, so Newton is far better than Einstein for real work in the real world because his equations are a lot easier. I would say that evolution is a law of nature. It’s generaly spoken of as the “theory of evolution,” since versions of it may differ. My favorite I got from an introduction to Darwin’s Origin of Species, where he quotes (only then to dismiss) Aristotle as having said more or less things vary by chance and what works persists. Since biolgical life cannot be eternal, reasoning from the laws of thermodynamics, it must reproduce. Reproduction, reasoning from the laws of thermodynamics, will not always be perfect. Therefore where there is life there will be evolution. Since organisms must live in a finite environment, there must be competition. Therefore there is a race to speciation; whatever manages undergo speciation first has a head start in evolving to occupy a new niche. And niches will always be coming and going. Given that speciation must occur, the argument from the way inheretance works (chromosomes in my example, but it would also include cytoplasm and cell membranes that must harmonize with chormosomes) indicates that there must be a limit to mating pool size. It’s a correlary of speciation, which is a correlary of evolution, but it’s still a law wherever there is sexual reproduction. Malthus works in bacteria. The mechanism must be the chemistry of the organism, so to the extent that chemistry is a quantum phenomenon the process is quantum. But Newton’s laws, while still trueish, are not significant at such small scales. Is evolution simply a set of feedback loops? Yes, that’s a good point. Evolution does feed back on itself in many loops in any organism. But simple … my shriveled little brain wouldn’t call it simple. Are feedback loops arrived at by simple forces of attraction and repulsion between chemicals, as with the sperm grouping? You could say that. Chemistry is all about forces of attraction and repulsion and it’s all chemistry, even if you call some of it biochemistry or physical chemistry. As for the sperm grouping, my best guess is that some amino acids are more hydrophobic than others. That is some are more like oil and some more like water. Water mixes with water better than with oil and oil also mixes better with itself. So if the surface of a sperm has a squence of amino acids that encodes something about its descent in terms of hydrophobia (poor choice; I don’t mean rabies) it would tend to stick with an identical code on another sperm. That wouldn’t work if you were using surface charge because like charges repel. Are the same forces that govern birth and death of stars/galaxies etc. at work on bio-populations? Can you imagine it? For untold eons people lived in places where tides were extremely important and never noticed they had anything to do with the moon. Thank you for giving me the opportunity to address your excellent questions. There have been 39 visitors since the new statitics.